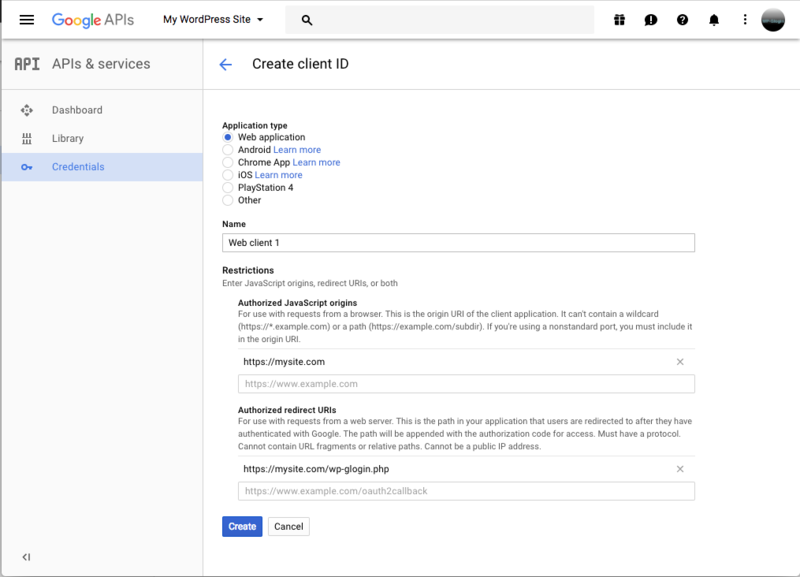 The instructions on this page presume you have installed either the Free, Premium, or Enterprise version of the Google Apps Login plugin and are now attempting to configure the plugin from the ‘Google Apps Login’ page under Settings in your WordPress admin area. 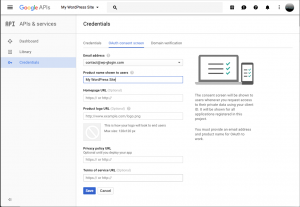 We will guide you through registering your site with Google Developers Console (which you will need to do unless the plugin has already been able to pull the settings through from the free version of the plugin, if you are upgrading to Premium/Enterprise). Please note that your version of the Google Developers Console may vary slightly. 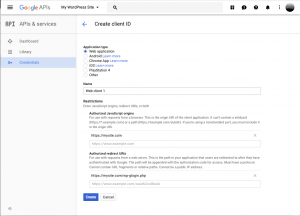 Within WordPress, start from the page Settings -> Google Apps Login – which is where you probably followed the link to this instructions page. 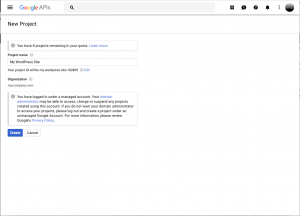 The G Suite (Google Apps) domain admin needs to go to https://console.developers.google.com/ (link will open in a new window). If you are not the domain admin, you may still have permissions to use the console, so just try it. 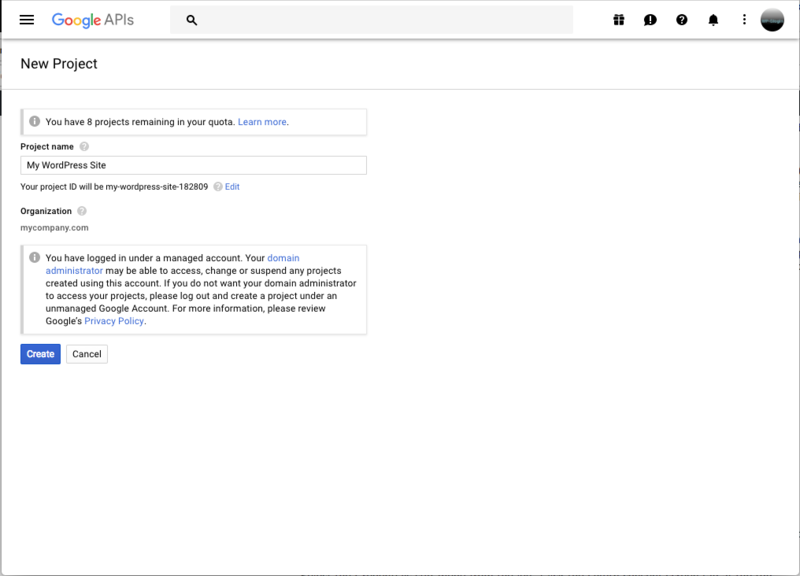 If you are not using G Suite (Google Apps), then just use your regular Gmail account to access the console. In the Google Developers Console, click into the Select a project dropdown box at the very top (this dropdown may show the name of an existing project instead), and click Create a project… or the ‘plus icon’ depending on what is presented. In the box that appears enter any name of your choice (such as your website’s name), then check the box to agree to terms, before clicking Create. You may be required to accept a verification phone call or SMS from Google. You can leave the Organization dropdown as it is at your top-level organization (you may not be presented with an organization choice anyway). Next, click into the new project if not already selected, then click APIs & Services from the top-left menu button. Select the Credentials sub-menu from the left. Click the OAuth consent screen tab at the top. You must select an Email Address if one is not already selected. You must also enter your company or blog name in Product name. Optionally, you can add your logo and other URLs to customize what your users see when they first login. Click Save. Then you must create a new ‘OAuth client ID’ entry within the project, of type ‘Web Application’. To create this, you need to click back into the Credentials tab, then click the blue Create credentials dropdown. 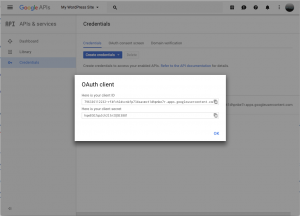 Click OAuth client ID. In the page that follows, select Web Application as the Application type. To create the Client ID entry, click the blue Create button. You will see on the screen a Client ID and Client Secret. You must copy and paste these values into the boxes back on the WordPress plugin settings screen – i.e. 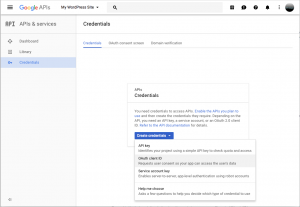 back in your WordPress admin, under Settings -> Google Apps Login. 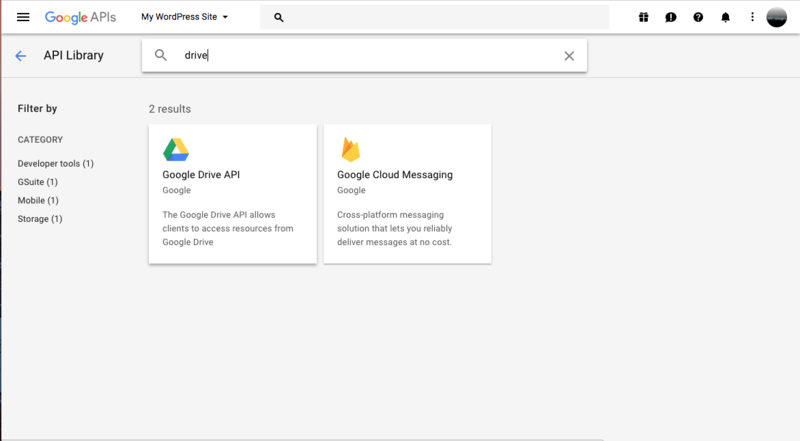 If you plan to use our Google Drive Embedder extension plugin, then you will also need to enable the ‘Drive API’ and ‘Calendar API’. To enable these, in the Google Developers Console, go back to APIs & Services and click Library from the left-hand menu bar. 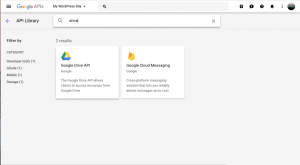 Search for each of Drive API and Calendar API and click into them so you can click the ‘Enable’ button. 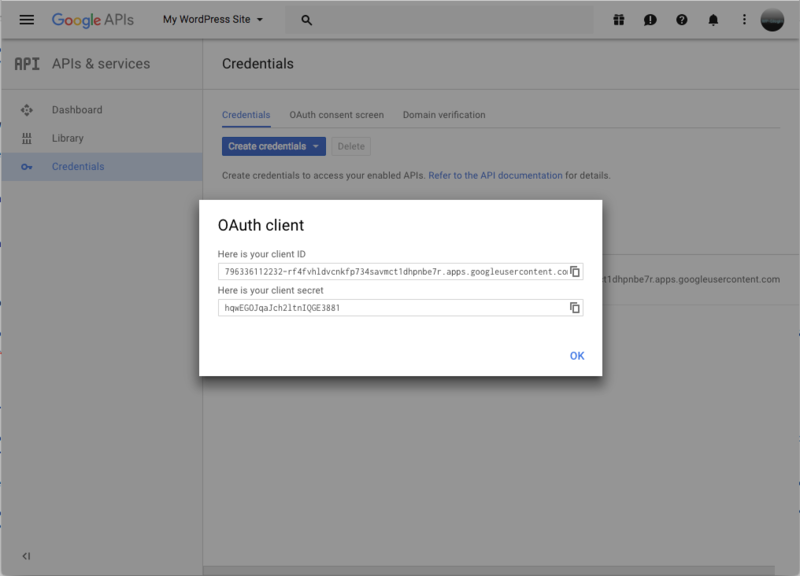 If you are using the Enterprise version of Google Apps Login, you will also need to enable Admin SDK. All done! 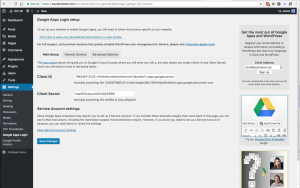 Save the settings in your WordPress admin, then try logging out. 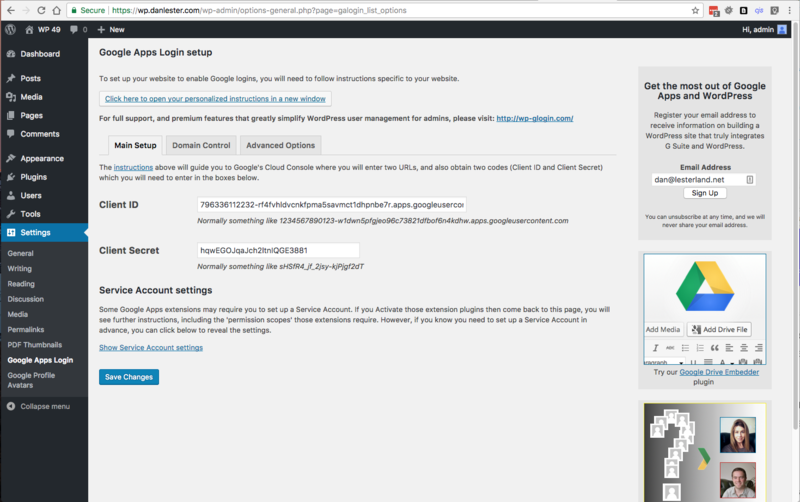 You should now see a ‘Login via Google’ button on your WordPress login page. 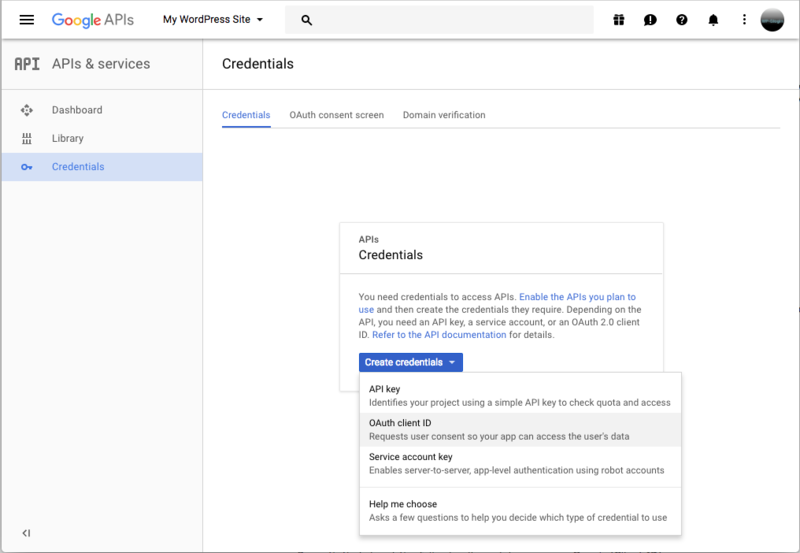 For certain extensions (Google Apps Directory, or the Enterprise version of Google Apps Login) you may also need to follow the instructions to set up a service account. If in doubt, please ignore for now. 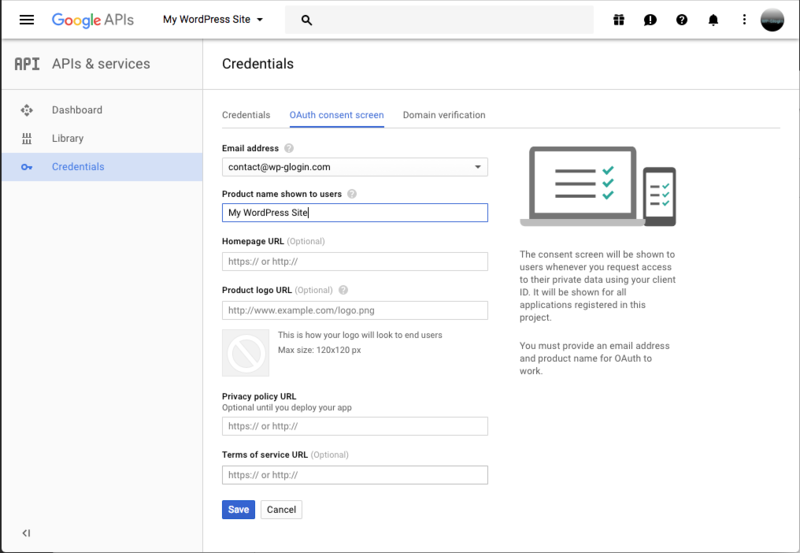 If you have purchased the Premium or Enterprise version of the plugin, please move on to the Premium Setup instructions to understand how to make use of the premium/enterprise features that automatically restrict access to users on your own G Suite (Google Apps) domain, including auto-creation of users. You can also learn about the (free/premium/enterprise) plugin’s Advanced Options and Multisite capabilities.